What do electrical power plants, refuse trucks, and your kitchen stove have in common? They all can be powered by natural gas, one of the most abundant fossil fuels in North America. Natural gas is the cleanest of all fossil fuels. It is used directly in its natural state in industrial capacities as well as in household appliances. As of 2016, it is also the predominant fuel for generating electricity. High quantities of natural gas flow from the Southwest — Texas, Louisiana, and Oklahoma — and the Gulf of Mexico directly through the heart of Mississippi, giving the state plentiful access to the natural resource, reduced energy cost, and the designation of hub for the southeastern and midwestern natural gas supply. 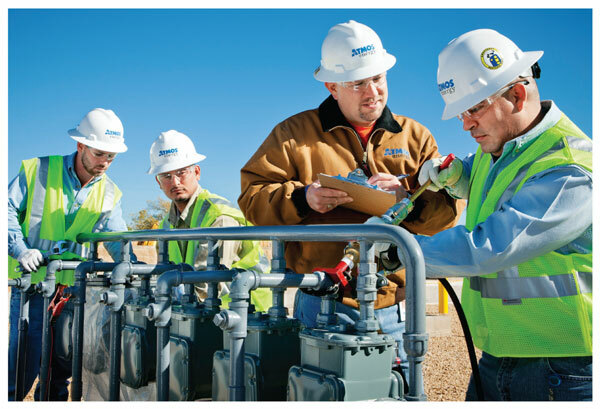 After significant growth through expansion and acquisitions, Atmos Energy Corporation has become one of the largest natural gas distribution companies in the U.S., serving over three million customers. The company operates in eight states, primarily in the Southeast and Midwest. The company owns storage facilities and pipelines, including one of the largest intrastate, natural gas pipeline systems in the state of Texas. 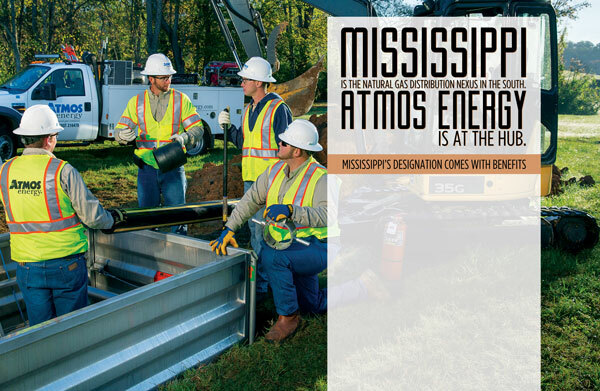 In Mississippi, Atmos Energy has become a leader for the energy community. Its publicly shared plan for proactive reinvestments in infrastructure improvements across the state demonstrates its commitment to long-term quality and safety. The company’s rising stock price is evidence that the investment community also shares enthusiasm for the company’s future. The cost of energy significantly affects the bottom line of most manufacturing and large business operations. 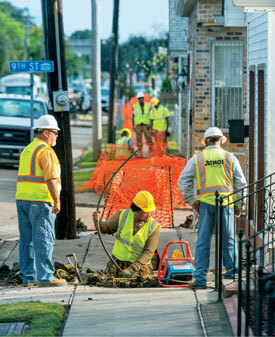 Mississippi’s access to abundant natural gas supply resources drives energy costs down for natural gas customers. The low cost of energy is one of Mississippi’s competitive advantages in attracting businesses, especially energy-intensive manufacturing businesses that depend on a low cost of energy to operate, such as Steel Dynamics in Columbus and Yokohama Tires in West Point. Natural gas is used regularly as an energy source for space heating, transportation fuel, commercial cooking, and various industrial processes. “Natural gas is more efficient, less expensive, and safer for the environment than generated electricity. Using natural gas results in only half of the greenhouse gases when compared to other fossil fuels used for electricity. It is also the least expensive major fuel source to use for heating,” says Kerley. The direct use of natural gas as an energy source (for instance, as used in a gas furnace or gas water heater) is the most efficient. When used directly, natural gas maintains about 92% of its usable energy after the production and distribution process. Thus, only 8% of energy is lost in the process. However, when natural gas is used as a fuel source to generate electricity, only 32% of usable energy is delivered to the customer. That equates to approximately 68% of the energy being lost in the generation and transmission process. So, when possible, it is always more efficient to use natural gas directly than to first convert it to electricity. Manufacturers that realize these advantages demand access to reliable natural gas for their manufacturing facilities, particularly when choosing new locations for expansion. At one time, natural gas was thought to be in short supply. Then came advances in technology that enabled production from shale rock that is located in virtually every part of the United States. Bolstered supplies have contributed significantly to lower price volatility. In 2014, the U.S. estimated that the combination of reserves plus resources was enough to meet America’s energy needs for more than 100 years. Price stability and long-term supply support a low risk profile that is highly attractive in today’s energy market. Access, safety, availability, low price, low volatility, stability, and utility are the attributes large manufacturers are seeking in an energy source. The U.S. produces over 85% of the natural gas it consumes, and more natural gas flows through pipelines in Mississippi than any other state in the U.S. Mississippi has a vast network of interstate pipelines, and most major pipeline companies are operating in Mississippi. Much of the gas flowing through the state is ultimately distributed to customers in the Northeast as well as to states along the Eastern Seaboard. The stability of the energy supply and the price point are both factors manufacturers weigh heavily when choosing a prospective location. The benefits of Mississippi’s superior access to natural gas are passed on to the manufacturing community through plentiful access and cost savings. Running a natural gas company is not easy. Companies that do not adequately account for pipeline maintenance, upgrades, and capital improvements, and those that do not understand and anticipate regulatory compliance, have a very difficult time surviving and sometimes find themselves in compromised positions. Atmos Energy has worked hard to make sure it has strong leadership, extensive fiscal planning, fortified reserves, and determination to address infrastructure upgrades proactively, before there are major issues, so that it delivers on its promise of safety and reliability for its customers. The plan to which Kerley refers is a long-term plan for infrastructure improvements. The annual company investments scheduled for infrastructure replacement are expected to rise to $40 million in 2017 and increase to $75 million by 2021. All long-term capital investment plans are reviewed and approved annually by public service regulators. Pipeline infrastructure installed decades ago traditionally used cast-iron and bare steel piping. Over time those materials corrode and create problems, especially if they were installed prior to the establishment of federal pipeline regulations. Many of the northeastern states have been plagued with failures and outages for this very reason. From 1999 to 2009, Atmos Energy started and completed the ambitious task of replacing its cast-iron piping infrastructure in Mississippi. In that 10-year period the company replaced over 200 miles of cast-iron pipe. Recently the company has ramped up its investments to replace aging infrastructure. The company commenced its current improvement plan in 2015 to continue its effort to replace bare steel piping. The remaining bare steel piping is being replaced with new, coated and wrapped steel piping using new welding techniques that are less susceptible to corrosion and leaking. These improvements in the distribution system promise to provide a more dependable working life of the piping infrastructure with improved safety and performance. Energy companies have been stepping up and providing plans and incentives for customers to be more energy efficient. Atmos Energy is among them, and in 2014 rolled out their SmartChoice Energy Efficiency Program. The United States is continually exploring ways to meet increasing demands for energy consumption. There is also a push to reduce the country’s dependence on international energy imports. Natural gas as an energy source has many benefits, including its abundance, high energy-to-use efficiency, and release of fewer greenhouse gases than any other fossil-based fuel. However, without a company to reliably manage the collection and distribution of natural gas, it would never be practical. The United States has become an energy leader in natural gas production. Because of Mississippi’s unique position as a distribution hub for natural gas, both residents and businesses benefit from the abundance of natural gas as a resource and its low cost point. It is critical that we have companies like Atmos Energy that can reliably and safely supply our homes and businesses with natural gas.